Hampi, a small town is the 14th century capital of greatest Vijayanagar Empire which has several historic and architectural monuments. Hampi is a UNESCO World Heritage Site, listed as the ‘Group of Monuments at Hampi’. Monuments in Hampi stands for its famous symbols of ancient civilizations, these monuments were built during AD 1336-1646. Excavation is still going on in Hampi by ‘Archaeological Survey of India’ to discover additional artifacts and temples. Monuments in Hampi includes beautiful temples, royal palaces and pavilions, tanks, ancient market streets, various pillars etc. Among these Achyuta Raya’s Temple stands as a wonderful monument. The outer courtyard are mostly in ruins with scattered pillars. There are two huge ruined towers, which gives way to the temple also there are many awesome carvings on the pillars in the halls. This Temple can be reached from the sides of Kodanda Rama temple. The Kodanda Rama Temple is situated at the end of the Virupaksha Bazaar. The temple covers a vast area and is adorned with pillars which is finely carved with various elegant sculptures and the inner sanctum of the temple has a rectangular shape. The street in front of Achyuta Raya's Temple is the Courtesans Street, In this street we can notice heaps of carved pillars on either side of the street. 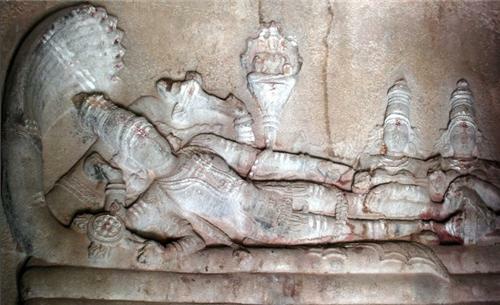 Ranganatha Temple is located in the north end of the Courtesans Street, here Lord Vishnu resting on the seven headed serpent Ananta is elegantly carved in the wall. Another interesting place having notable monuments is Zeneth Enclosure. It is a structural complex with walls on four sides with entrance. It has Jal Mahal, very popular Lotus Mahal, Watch towers, Tanks, Elephant Stables etc., Lotus Mahal is the most marvelous structure in Hampi. It shows a Hindu-Islamic Culture with Mesmerizing carvings and artistic work done in pillars on this building. Elephant stables is one of the few least destroyed structures in Hampi, Elephant Stable is always the major attraction for tourists. It consist of a long building with a row of 11 domed chambers, it was once used to park the royal elephants. Another vast area where the fallen Vijayanagara Empire stood is known as Royal Enclosure. It is a wide open area with hundreds of square meters, this area has a number of interesting monuments like halls, tanks, chambers etc., One of the beautiful remained in Royal enclosure is Stepped tank. This Stepped tank is beautifully designed using finely finished black schist stone blocks. This tank was discovered during excavations. Stone doors in the entrance of Royal Enclosure is always an unnoticed attraction. It is a pair of fallen stone doors. Probably, it must have been the entrance of some important royal building. It has the typical feature of wooden doors. 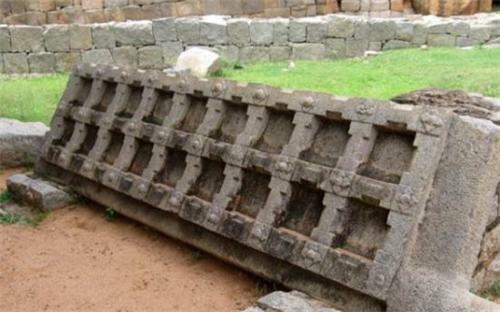 Other Temple Monument includes Hazararama Temple, Krishna Temple Complex, Malyavanta Ragunathaswamy Temple, Sasivekalu Ganesha, Virupaksha Temple and Vittala Temple. Hazara Rama temple is famous for its carvings in the walls. Story of Hindu mythology, Ramayana is tremendously carved onto the walls of this temple. It is stunning to see the long array of carving in the walls. Krishna Temple Complex is an excavated and restored temple. It is well known for its exquisite carvings and beautiful architectural designs. This complex is decorated with pillared halls and many small shrines. Malyavanta Raghunathaswamy Temple resembles the typical ancient style of architecture. The Magnificent entrance tower is the best example of Hindu temple architecture. It has wonderful and interesting images of fish and other marine creatures fortified inside its inner walls. It is located in the Malayavanta hills. Sasivekalu Ganesha is one of the monolithic statue carved out of a huge boulder, it is 8 feet tall. Another giant statue of Ganesha near Sasivekalu Ganesha is Kadalekalu Ganesha, which is 15 feet tall. It is located in the slope of Hemakuta Hill. Virupaksha temple is one of the oldest functioning temples in India. It is incepted in the 7th century AD, it has pillared hall with wonderful carvings known as 100-column hall. The other most outstanding temple in hampi is Vittala Temple which has the most extravagant architecture. The highlight of Vittala temple is its impressive pillared halls, Stone Chariot and Kings Balance. The outermost pillars are popularly known as the musical pillars which emits musical tones when tapped. Stone Chariot is one of the major tourist attraction. It is built using huge granite blocks and is marvelously carved and decorated. Kings Balance (Tula Bhara) has two elevated granite pillars about 15 feet high supporting a stone beam about 12 feet, King used to weigh himself with gold, gems, silver and precious stones, and distributed to the priests. 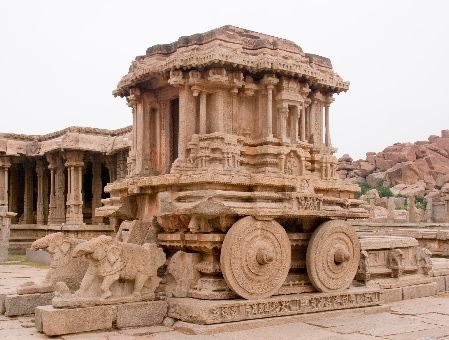 Hampi is "worth a journey" for everyone, especially who love History and Monuments.